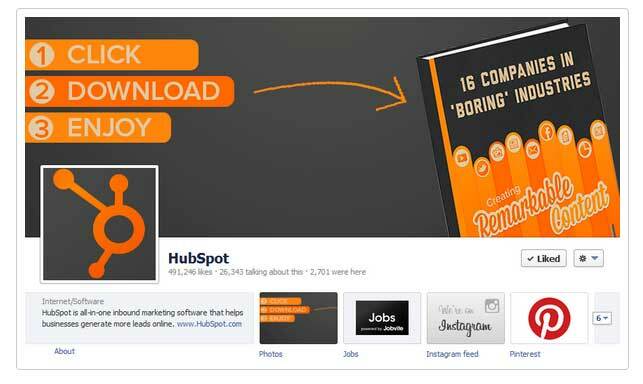 The Facebook Timeline Cover Photo opens up a world of creativity for marketers – if you use it in clever ways. In this post, I will show you one quick way to take advantage of your Facebook Timeline Cover Photos – something that you might not have thought of. In fact, very few people are using this strategy, so it’s time you took advantage of it! It’s the first thing people see when they come to your page. When you change your Facebook Timeline Cover Photo, Facebook “announces” it on the newsfeed, and it will often get good airplay with your fans (you know the story – not all of your posts get “seen” so anything that Facebook favours has to be a good thing, right?). Facebook have released the restrictions on the Cover Photo and now you have a little more leave-way to play with it. 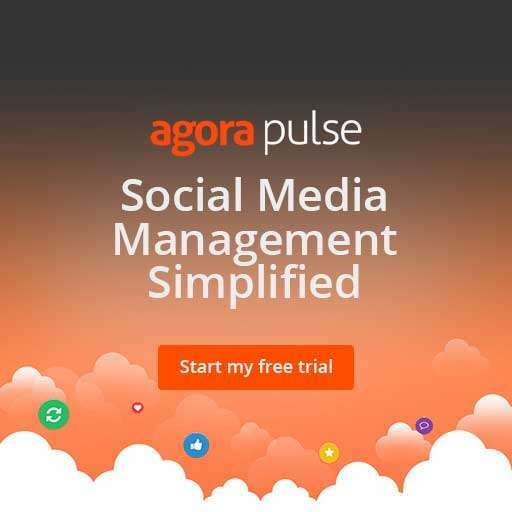 No longer are you prohibited from including calls to action – you can CTA to your heart’s content. Which means the click here, do this, download this, subscribe to this, watch my webinar, come to my event shout-outs are allowed. That’s very cool. The only thing you need to be aware of is that you can’t have any more than 20% text on your Cover photo. And every Facebook update brings more and more emphasis on Photos. Images. Visual Content. Need I say more? 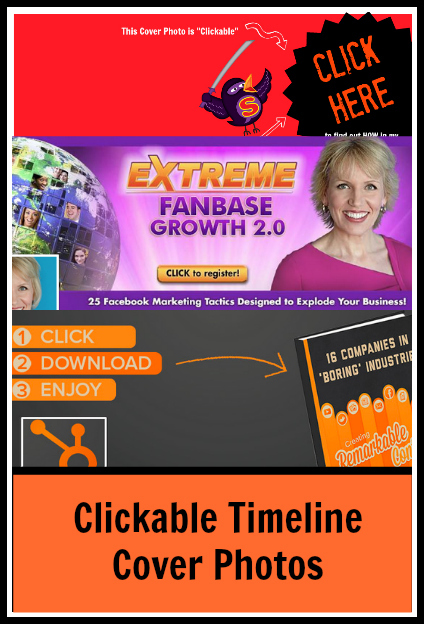 So, how can a Timeline Cover Photo be “Clickable”? When you Click on the Timeline Cover Photo, the photo will “open up” allowing the person to see the extra description you enter. When you first upload the cover photo you have the opportunity to add a “description” and enter additional information. event………. are you with me? Take a look at my recent cover photo – there is a strong call to action to click on the “button” in order to access my e-book. All arrows lead to clicking the button…. The description allows you to add a clickable link and more information about where you are sending them and why! Click on the Big CLICK HERE and you arrive at the description and URL below…. 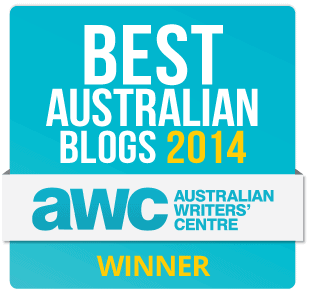 …where you are directed right back to THIS blog post. If you click on the somewhat cheeky CLICK HERE then you are directed to the description above and the URL for THIS blog post. In fact, that might be exactly how you arrived here. Like? Well, actually you can use “Like” as a call to action too…but that’s for another blogpost. Remember: it is a two step process. The main cover image is not “clickable” in terms of being an instant URL, but once you click ON it you arrive at the second description box with a clickable URL. 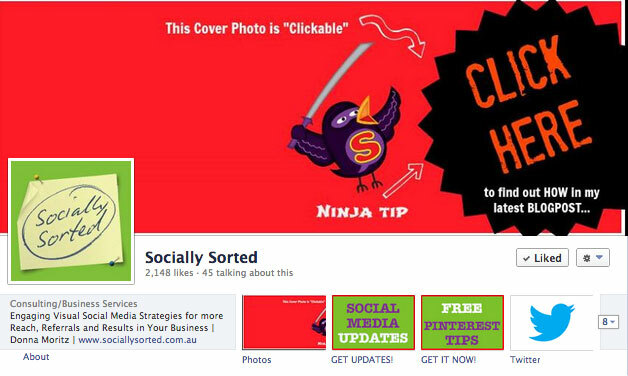 As a result you can be very clever iwth your use of “click here” buttons on your cover photo. Have some fun with it. 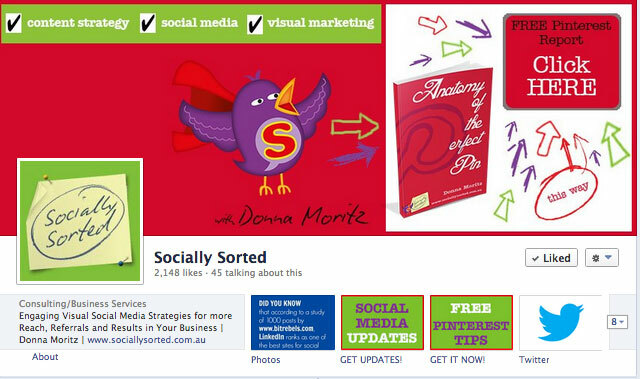 I created the last timeline cover photo using PicMonkey – my favourite visual social media tool at the moment. And if you want to find out some GREAT tips for using PicMonkey and other tools to do awesome things with visual social media, then be sure to subscribe to my updates (at the end of this post or on my home page) as I will be announcing a fabulous new program very soon! Leave a comment below – have you seen any great Timeline Cover Photos that caught your attention or made you click? We would love to hear about them. Leave me a URL to the Facebook page so we can check it out! 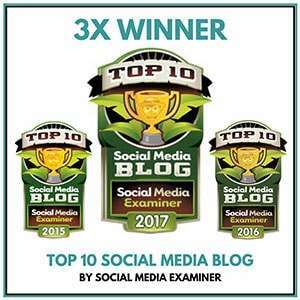 ← What Do You Want to Know About Creating Rockin' Images that get Shared and Drive Traffic?